BaddDDD Sonia Sanchez has been nominated for a News & Documentary Emmy Award for Outstanding Arts & Culture Documentary. Directors/ producers include Barbara Attie, Janet Goldwater, Sabrina Schmidt Gordon, and featured artists are Nikki Giovanni, Amiri Baraka, Questlove, Jessica Care Moore, Ursula Rucker, Yasiin Bey (aka Mos Def), Talib Kweli, Haki R. Madhubuti and Bryonn Bain. Sonia Sanchez is a seminal figure in the 1960s Black Arts Movement and was one of the first activists to secure the inclusion of African American studies in university curricula. 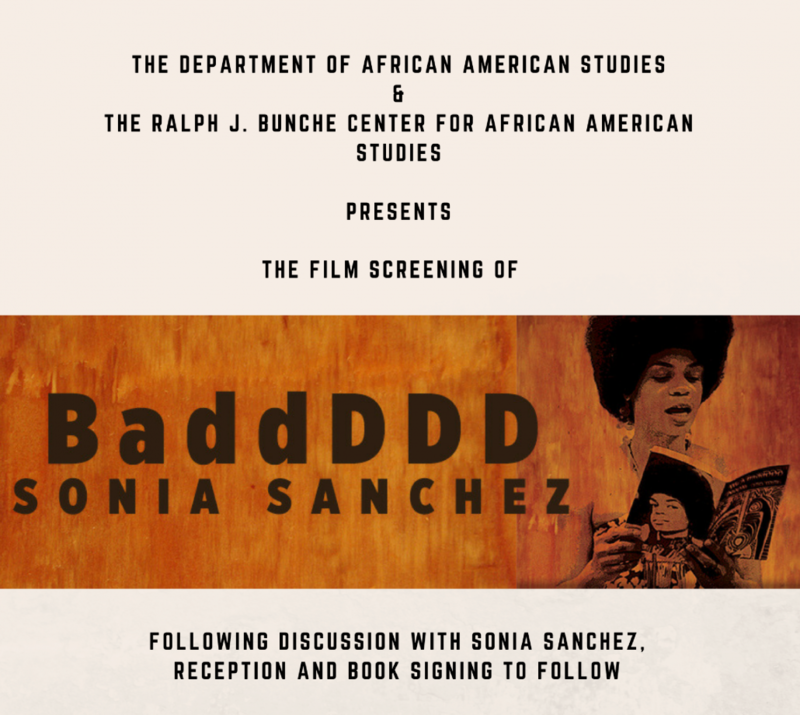 The Department of African American Studies and the Ralph J. Bunche Center for African American Studies presented a film screening of BaddDDD Sonia Sanchez on May 17, 2017 at the UCLA California NanoSystems Institute Auditorium; the screening was followed by a discussion with Sonia Sanchez, reception and book signing. Congratulations again to Sonia Sanchez, the producers, and featured cast!